Thanks to a partnership between FireAngel and Intamac, everyone can be safer in their homes. FireAngel is the European leader of home safety products. They produce smoke, heat & cold alarms and carbon monoxide detectors for both residential and commercial buildings. Their mission is that everyone should be properly protected with affordable and reliable home safety products. It is an innovative and forward-thinking brand, and this must come through in their products. In order to remain a market leader, FireAngel need to take advantage of emerging technologies and use them in a way that creates new markets and benefits their customers. So, they approached Intamac to discuss how they might use IoT to ensure the safety of their customer’s homes. Wouldn’t it be great if the authorities could be alerted if a home was consistently too cold? FireAngel realised that they could save lives by connecting cold alarms in the homes of the elderly to the internet throughout the winter. They could offer important device data from connected products so their partners, like Humberside Fire & Safety services, to proactively serve their customers. FireAngel own a proprietary technology called Wi-Safe. This protocol means their devices can communicate with each other within a local network. However, FireAngel needed a way to send the device data outside of the local network, so it could be securely accessed anywhere and at any time. So, data from their sensors can be sent to a fire station, or other service provider. In the case of a cold alarm, the emergency services could monitor if a house is consistently too cold through the winter, so they can rescue the person inside. Intamac has considerable experience developing IoT technologies, and so we can implement bespoke solutions quickly and with limited risk to our partners. FireAngel wanted to leverage this expertise to ensure that they can take the product to market fast. It is also cost effective compared to building in-house. The brief was to deliver a tailored solution that communicates with their patented radio technology ‘Wi-Safe’ and captures the data and events from their safety devices. Intamac had to create a bespoke solution which communicated with the patented Wi-Safe radio. This is not an industry established protocol like Zigbee, so the technology had to be custom made. To do this, we engineered end-end software solution - implemented ensoAgent and ensoCloud - and collaborated with third parties to develop required hardware. We successfully connected FireAngel’s devices enabling them to offer connectivity for existing device types, thereby reducing costs. Through Intamac’s platform and technology, FireAngel has the capability to offer mobile and web applications to their clients with different permissions and views of device data based on client needs. These applications give their clients an instant view of all device statuses and the ability to track and report early warnings when something needs attention. Our IoT product met FireAngel’s mission critical applications with high reliability and up-time service. Once the initial proof-of-concept had been developed, it was clear that Intamac’s platform capabilities could be used for other applications. For example, FireAngel is a leader in the German market. In Germany, rental accommodation is very popular and landlords are legally obliged to ensure their properties are fitted with a fire detector, which has to be tested every year. Previously, landlords had to do this manually, either by going to the properties themselves, or sending someone else. Today, with FireAngel’s device management and admin applications, they can test the alarms remotely. This reduces service costs and operational risk. Ultimately, Intamac has given FireAngel real-time access to status and environment data collected from all their devices. It’s easy for them to define critical thresholds and alerts so they know when a particular area or customer needs attention. 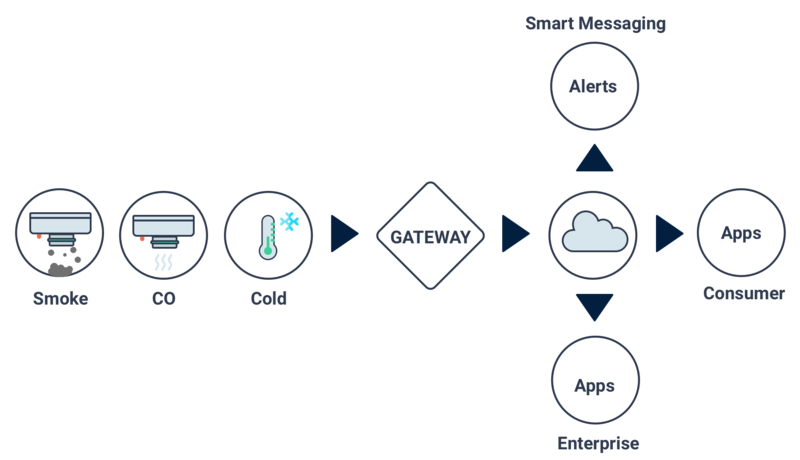 These alerts can be triggered based on a set of device statuses and business needs, providing intelligence and automation. Diagnostic and predictive analysis of alerts provides FireAngel with the ability to analyse the risk profile of end customers, and offer personalised service. There are multiple future applications that we are now exploring together. FireAngel were the first movers in their market. They were able to refine the product and validate IoT solutions before anyone else. Now their competitors are playing catch up. Working with Intamac, FireAngel produced a connected solution faster, at a lower risk and with lower costs. FireAngel’s brand is about innovation and leading the way in home safety products. With Intamac, they continue to achieve this goal.